By designing and fashioning my own textures as well as individually hand-hammering and hand-sawing each piece ​of metal, I create simple yet elegant jewelry. My original textures are carefully hand-hammered into each piece of metal. Multiple layers are attached with sterling silver or gold-filled jump rings. Rivets are meticulously hand-hammered into place. Jewelry is made from heavyweight 22 gauge sterling silver, 14k gold-filled or a nickel silver blackened by an exclusive process developed in my studio. Necklaces come on an 18” sterling silver chain, some with handcrafted t-bar closures. 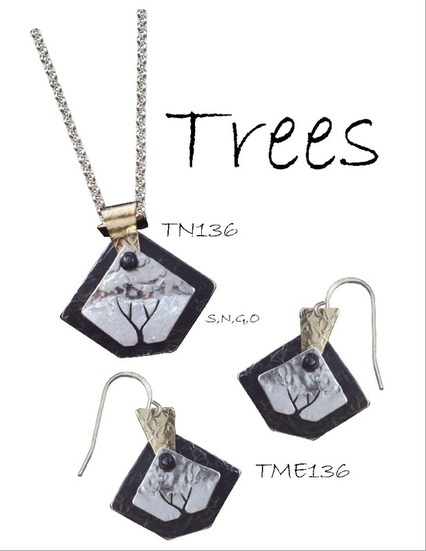 Jewelry is available in Tree, Yoga, Solo Dancer and the modern Mixed Metal. Click photo below to go to page.